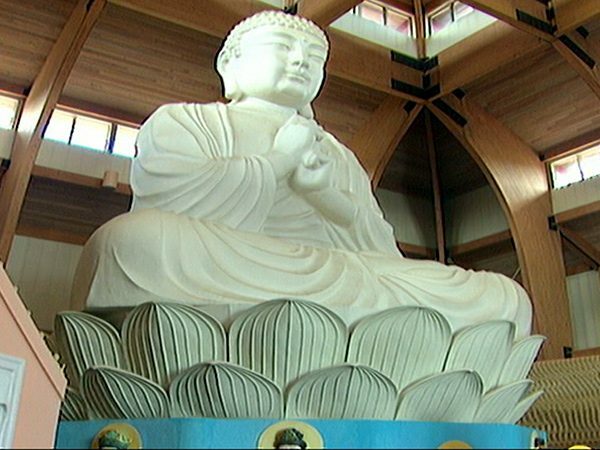 HARRY LEONG (at memorial service, Chuang Yen monastery's Great Buddha Prayer Hall, Carmel, NY): Over 30 families are here today for the spring memorial service, and they're from all over the country and even from overseas. The families are here together because for traditional Chinese families, it's considered very important for them to be present at the time when the ashes are interred, because it's considered their filial responsibility. We chant the mantra for rebirth in the Pure Land because it creates merit. And then, when that merit is generated, we share and we dedicate it to the deceased, which helps the deceased achieve a positive rebirth, or even better, rebirth in the Pure Land. In Buddhist literature, the Pure Land is described as this very beautiful and perfect place where everything that you see gives you this longing to achieve rebirth there -- this place created by Amitabha Buddha as a means for us to achieve enlightenment quicker, because the mind is pure. The mind is purified of defilements and the mental afflictions so we can practice without distraction, without suffering. In Buddhism we believe that all beings are bound to samsara. Samsara is what non-Buddhists understand as reincarnation. So long as one doesn't achieve spiritual enlightenment, one's continually reborn in samsara, over and over again, and for Buddhist practitioners, the goal is to escape from this cycle, to achieve supreme Buddhahood, which is nirvana. Buddhism makes us understand that death is a natural progression of life. 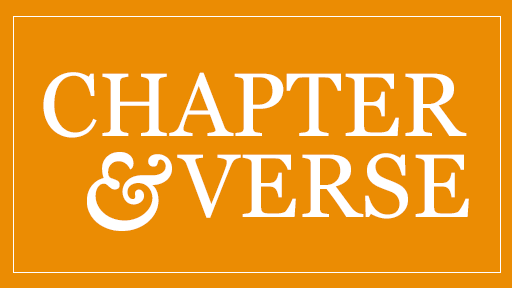 Even though we understand that death and impermanence [are] inherent in all things, I think it's still difficult for us to let go of our loved ones. I think about impending death all the time. When you remind yourself about your own mortality, it gives you motivation to have diligence in spiritual practice, because you feel like time's running out. My goal in this human realm is the same goal as for all Buddhist practitioners, which is to practice compassion and try to benefit other living beings. And then, hopefully, at the end of this life, to achieve rebirth in the Pure Land. 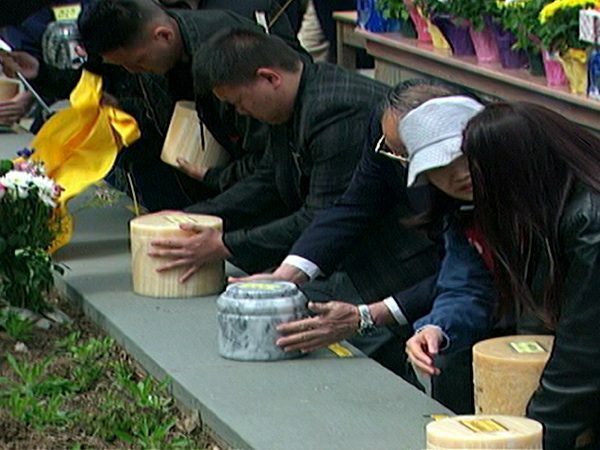 We take you inside the Chinese Buddhist tradition of honoring deceased family members at the place where their ashes are interred. 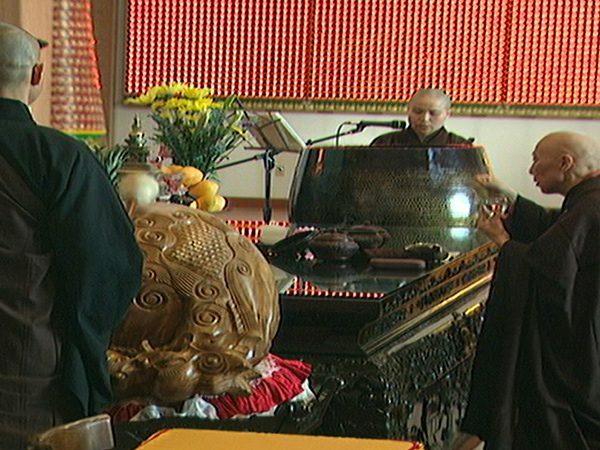 Harry Leong of New York City was our guide as he and his mother remembered his late father at the Chuang Yen monastery in Carmel, New York. He spoke to us about the Buddhist belief in reincarnation and the hope that prayer and good deeds will help the deceased achieve better and better lives, until eventually they’re reborn in the Pure Land.